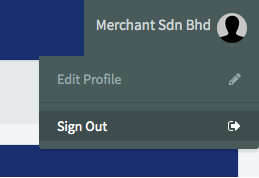 If you have done doing your senangPay activity for the day and need to log out, simply click the log out button. 1. Go to the top header on your right side. 2. You will see your profile avatar. 3. Click at the profile avatar, a drop down menu will appear. The Dashboard will be auto sign out if you left the dashboard idle within 1/2 hours for security reason.